SAN SALVADOR, El Salvador — The tiny nation of El Salvador is scrambling to receive thousands of children deported from Mexico back to their home country. 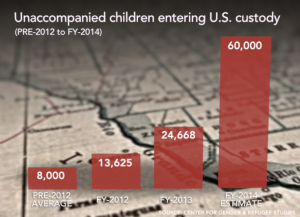 In coming months, more children are anticipated to arrive, this time deported from the United States. The country is under pressure from not only the U.S. and Mexico to keep these kids home, but also from its own people to provide protection for its children. 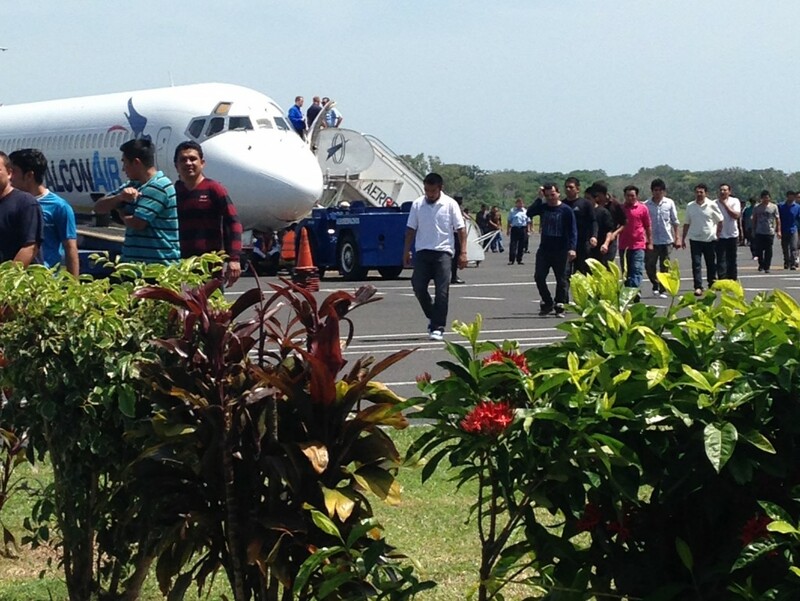 The Salvadoran government lacks the resources and infrastructure to ensure a safe homecoming. Buses carrying children arrive from Mexico to the lone deportee center in the capital of San Salvador called La Chacra, or the farm, at least a couple times a week. They lurch through tall iron gates topped with barbed wire, past groups of people waiting out on the street. More than 52,000 unaccompanied children were caught trying to cross the southern U.S. border in the first five months of this year. Read about what’s behind this surge of migrants. Inside the gates, grandmothers, sisters, fathers and mothers wait for children who left alone to try to make it North. “I feel happy to have him here. It’s not nice to watch him leave,” a mother said in Spanish. She was just reunited with her 15-year-old son. She said she’s happy to have him home. She did not want to use her name out of fear of retaliation from gangs. Her hair was pulled back into a neat, tight ponytail, and she wore dark pink lipstick. She wiped away tears as she explained that the government has threatened to arrest her or take her son away if he tries to leave again. “Here you can’t move forward or backward. What can I do? I can’t do anything,” she said. A government official later confirmed that if a child migrates more than once, there is a follow-up visit to the home by the government and a possible fine for the guardian. He said if people can afford to pay coyotes to take their children to the U.S., they can afford to pay a fine. Another deportee center is at the airport, about 30 minutes outside of the capital. It’s called “Bienvenido a Casa,” or “Welcome Home.” Mauricio Silva of the El Salvador Department of Immigration is there. Silva said since January more than 3,250 children, with a parent or alone, have been returned back to El Salvador. The vast majority of them were stopped in Mexico. Silva admitted his agency is not ready for a big increase of child deportees from the United States. “We coordinate with [U.S. Immigration and Customs Enforcement] to not send flights with families of 60 or 70 people, that they’re smaller groups so that we can treat them in a humane way,” Silva said in Spanish. So far, only three planes with deported mothers and some 27 children have arrived from the U.S. this summer. He said there is talk of renovating this space or building a new facility. Silva said the process to “welcome home” a child is more extensive. The government interviews the children to assess trauma. “If the kids live in a place that is high risk because of gangs or something, they have to go stay in another location with another family member or have to be put in an institution to protect their life,” Silva said. Mayuly Ferrufino is corporate relations director for Glasswing International. It’s a non-profit that operates in Central America, funded by international business groups and in part, by the U.S. government. They focus on public education and health, but lately they’ve been drawn into this effort to help returning migrants. “There’s not enough resources. I think nobody was prepared for this and that’s why it’s called a humanitarian crisis,” Ferrufino said. She said migrants pass through La Chacra in only a matter of hours, because it is not a place people want to stay. But she said these moments of re-entry, at the airport and the migrant center, should be seized as an opportunity to help. “Because after they go out those doors, you won’t see them again. So that’s the moment where you have to give them medical attention, psycho-social attention, and we want to have a resources specialist to make the connection of services in their communities,” Ferrufino said. 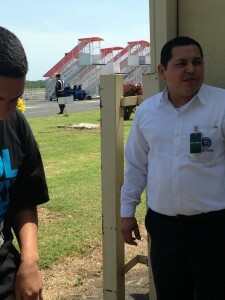 Glasswing volunteers work at La Chacra a couple times a week to make deportees feel more comfortable. She said they hope to be involved with a renovation of the space. 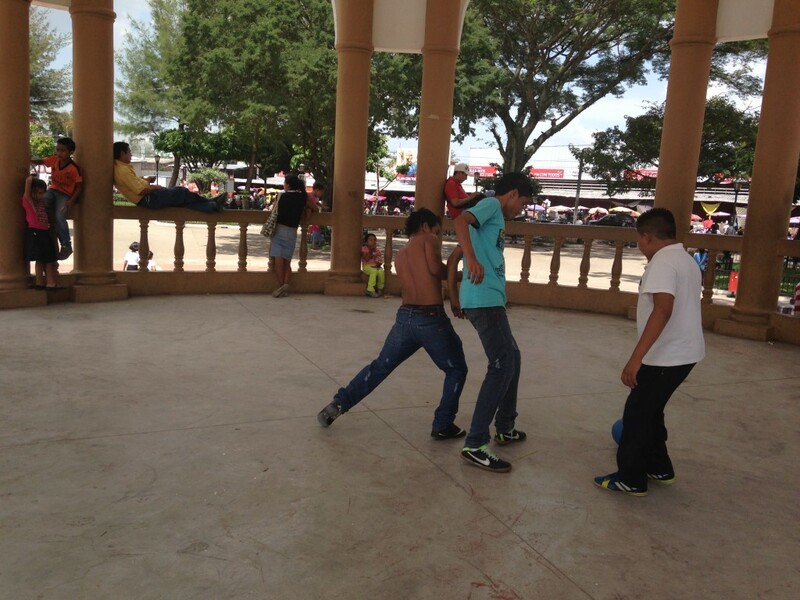 Inside La Chacra, teenage brothers Bryan and Dennis Amalara, said they left together to escape gangs and they hoped to see their mom in the U.S. They only made it to Mexico. As part of the return process, a nurse asked each of them to take a deep breath to get ready for a tetanus shot. 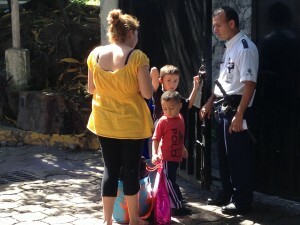 They said they are relieved to be home safe, but also do not have faith that life here in El Salvador can change. “Here the situation with crime can’t be fixed from one day to the next, and in the U.S. we know the laws might not allow us to stay,” said older brother Bryan. Many of the people we spoke to, adults and children, told us as they were leaving the deportee centers that they were afraid. The government has not done enough to make people feel safe to return home. In El Salvador, people are aware that the legal process for the country’s nearly 10,000 unaccompanied child migrants that arrived in the U.S. this year will take some time. It may be months before deportations begin. That’s a good thing. Time is what’s needed before this country is ready. This story was reported by the Fronteras: Changing Americas Desk, a multimedia collaboration among seven public radio stations. It is led by KJZZ in Phoenix and KPBS in San Diego and funded by the Corporation for Public Broadcasting as part of its Local Journalism Center initiative. Another version of this article aired on Here & Now.